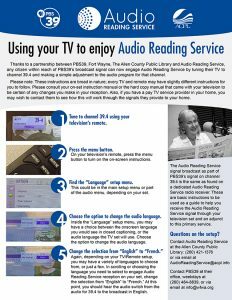 PBS39, in partnership with the Audio Reading Service based at the Allen County Public Library, offers area TV viewers the opportunity to access and enjoy ARS Service without the special radio receiver normally used to gain access to this valuable service for the vision or reading impaired. Audio Reading Service (ARS) is a free radio reading service for people who are blind or have a visual or a reading impairment. For thousands of people in northeast Indiana and northwest Ohio, ARS is a source of in-depth news, current events and their community information connection for over 25 years. In this service, ARS volunteers read local news and features from a dozens of area newspapers, plus magazines, books, grocery ads, obituaries and more. This expansion of ARS allows viewers in a greater geographic area to be able to access ARS broadcasts now by using their television set, in addition to special ARS receivers, tuning to channel 39.4 and changing the audio settings for this channel on their television set to allow for the reception of the ARS broadcast as it is simulcast over channel 39.4. The ARS broadcast does not replace channel 39.4’s normal audio stream, but rather, rides along the transmission of channel 39.4 and remains independent of the TV content broadcast on channel 39.4. Those viewers who watch channel 39.4 normally without any voluntary changing of their TV’s audio setup menu should not notice any change at all in the delivery of normal reception. To download a PDF instruction sheet showing you how to engage the ARS service through your TV, click here. To contact PBS39 for more information or assistance, call (260) 484-8839 or contact us via email at info@wfwa.org. Thanks to reNew Upscale Resale for their underwriting the continued financial support necessary for this collaboration to serve the northeast Indiana region.